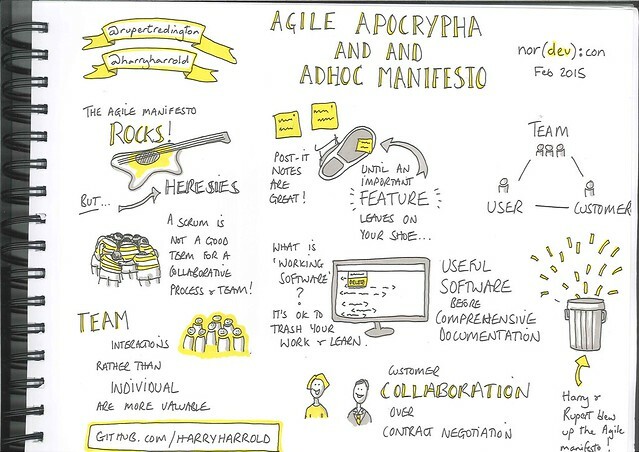 "Harry and Rupert present a survey of the cults, sects and heresies they’ve encountered while working with people “doing agile”, culminating in their formulation of a new “ad-hoc” manifesto. Doctrinal purists are invited to be appalled." The video of the 2015 performance is at https://www.infoq.com/presentations/agile-variations - although it's difficult to follow without the graphics. The actual presentation was delivered using a folder of images, which we displayed as the background to a greenscreen'ed board on which we slapped post-it notes to make any points we needed to write down. First thing we did was wrote the session title and pitch, and started reading round the subject. That material is mainly in "The Dump" at https://github.com/harryharrold/performance/wiki/The-dump - augmented by a lists of notes from a session at UKGovcamp 2015 - http://lanyrd.com/2015/ukgc15/sdhffx/ A couple of days stacking up post-it notes got us a list of things to say, then a couple of days of purest keyboard bashing got us to the session sections at https://github.com/harryharrold/performance/wiki/ From there, we moved to the full text to https://github.com/harryharrold/performance/blob/master/FullText.md so we could hammer at it properly. That then made it into a cuelist at https://github.com/harryharrold/performance/blob/master/cuelist.md - all image CC-BY licensed for commercial use, although we need to be clearer about referencing ownership. Thanks to the good offices of Seb Rose - https://twitter.com/sebrose - we got to do it again at XP2016 - http://conf.xp2016.org/events/xp-2016-edinburgh/event-summary-bfae67b3644e4052b7b3fbfdc941a4af.aspx - and if you ever get the chance to do a conference at Edinburgh - do. That's it - I think our fifteen minutes of fame is over for this one, but it was a lot of fun doing a session where you could genuinely say that things caught fire and exploded. And that it was meant to be that way.